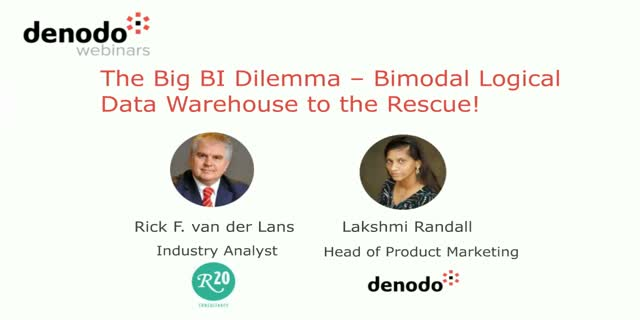 The Big BI Dilemma - Bimodal Logical Data Warehouse to the Rescue! The classic unimodal data warehouse architecture has expired because it is restricted to primarily supporting structured data but not the newer data types such as social, streaming, and IoT data. New BI architecture, such as “logical data warehouse”, is required to augment the traditional and rigid unimodal data warehouse systems with a new bimodal data warehouse architecture to support requirements that are experimental, flexible, explorative, and self-service oriented. Learn from the Logical Data Warehousing expert, Rick van der Lans, about how you can implement an agile data strategy using a bimodal Logical Data Warehouse architecture. When it comes to storage, a byte is a byte is a byte, isn’t it? One of the enduring truths about simplicity is that scale makes everything hard, and with that comes complexity. And when we’re not processing the data, how do we store it and access it? In this webcast, we will compare three types of data access: file, block and object storage, and the access methods that support them. Each has its own set of use cases, and advantages and disadvantages. Each provides simple to sophisticated management of the data, and each makes different demands on storage devices and programming technologies. Join SSSI members and respected analysts Tom Coughlin and Jim Handy for a look into their new Emerging Memory and Storage Technologies Report. Tom and Jim will examine emerging memory technologies and their interaction with standard memories, how a new memory layer improves computer performance, and the technical advantages and economies of scale that contribute to the enthusiasm for emerging memories. They will provide an outlook on market projections and enabling and driving applications. The webcast is the perfect preparation for the 2019 SNIA Persistent Memory Summit January 24, 2019. If you’re a storage equipment vendor, management software vendor or end-user of the ISO approved SNIA Storage Management Initiative Specification (SMI-S), you won’t want to miss this presentation. Enterprise storage industry expert Mike Walker will provide an overview of new indications, methods, properties and profiles of SMI-S 1.7 and the newly introduced version, SMI-S 1.8. If you haven’t yet made the jump to SMI-S 1.7, Walker will explain why it’s important to go directly to SMI-S 1.8. In the history of enterprise storage there has been a trend to move from local storage to centralized, networked storage. Customers found that networked storage provided higher utilization, centralized and hence cheaper management, easier failover, and simplified data protection, which has driven the move to FC-SAN, iSCSI, NAS and object storage. Network-intensive applications, like networked storage or clustered computing, require a network infrastructure with high bandwidth and low latency. Remote Direct Memory Access (RDMA) supports zero-copy data transfers by enabling movement of data directly to or from application memory. This results in high bandwidth, low latency networking with little involvement from the CPU. In the next SNIA ESF “Great Storage Debates” series webcasts, we’ll be examining two commonly known RDMA protocols that run over Ethernet; RDMA over Converged Ethernet (RoCE) and IETF-standard iWARP. Both are Ethernet-based RDMA technologies that reduce the amount of CPU overhead in transferring data among servers and storage systems. The goal of this presentation is to provide a solid foundation on both RDMA technologies in a vendor-neutral setting that discusses the capabilities and use cases for each so that attendees can become more informed and make educated decisions. •Both RoCE and iWARP support RDMA over Ethernet, but what are the differences? •Use cases for RoCE and iWARP and what differentiates them? •UDP/IP and TCP/IP: which uses which and what are the advantages and disadvantages? •What are the software and hardware requirements for each? •What are the performance/latency differences of each? We’re increasingly in a multi-cloud environment, with potentially multiple private, public and hybrid cloud implementations in support of a single enterprise. Organizations want to leverage the agility of public cloud resources to run existing workloads without having to re-plumb or re-architect them and their processes. In many cases, applications and data have been moved individually to the public cloud. Over time, some applications and data might need to be moved back on premises, or moved partially or entirely from one cloud to another. That means simplifying the movement of data from cloud to cloud. Data movement and data liberation – the seamless transfer of data from one cloud to another – has become a major requirement. •How do we secure data both at-rest and in-transit? •Why is data so hard to move? What cloud processes and interfaces should we use to make data movement easier? •How should we organize our data to simplify its mobility? Should we use block, file or object technologies? •Should the application of the data influence how (and even if) we move the data? •How can data in the cloud be leveraged for multiple use cases? GDPR requires organizations to identify, classify, and protect personal information, but how do you prepare and protect against a possible breach if you don't know what data you have, where it lives, or how it's classified? With the General Data Protection Regulation (GDPR) becoming enforceable in the EU on May 25, 2018, many data scientists are worried about the impact that this regulation and similar initiatives in other countries that give consumers a "right to explanation" of decisions made by algorithms will have on the field of predictive and prescriptive analytics. In this session, Beau will discuss the role of interpretable algorithms in data science as well as explore tools and methods for explaining high-performing algorithms. Beau Walker has a Juris Doctorate (law degree) and BS and MS Degrees in Biology and Ecology and Evolution. Beau has worked in many domains including academia, pharma, healthcare, life sciences, insurance, legal, financial services, marketing, and IoT. You won’t want to miss the opportunity to hear leading data storage experts provide their insights on prominent technologies that are shaping the market. With the exponential rise in demand for high capacity and secured storage systems, it’s critical to understand the key factors influencing adoption and where the highest growth is expected. From SSDs and HDDs to storage interfaces and NAND devices, get the latest information you need to shape key strategic directions and remain competitive. You've got data. It's time to manage it. Find information here on everything from data governance and data quality, to master and metadata management, data architecture, and the thing that was just invented ten seconds ago. Title: The Big BI Dilemma - Bimodal Logical Data Warehouse to the Rescue!